The Bible, Ten Commandments, Rules and Regulations: Are These for Our Good? In Part One, we have already discussed somewhat how God has meet man's needs of motivation, man's need of a standard and his need of reminders. 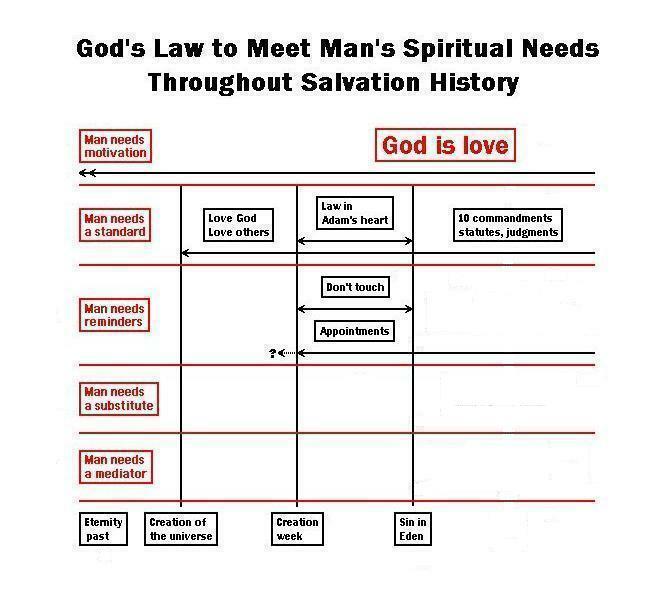 From that point we will go on in the Bible and the Ten Commandments to understand more of God's law and how it meets man's needs. 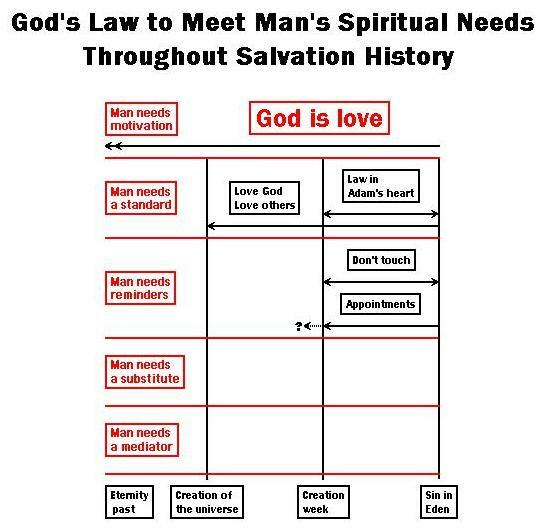 Here is the diagram we finished with in Part One having just added "Sin in Eden" to our bottom time line. The diagram shows the relation of the principles we have covered to this point to the major events of salvation history. In Part Two, we will now look more closely at each of the principles concerning the spiritual needs of man after sin entered and follow their application and expansion through the great events of salvation history: Sinai, Calvary, the end of sin and on into eternity future. When man sinned he broke the law. But he did not break it like breaking a glass or mirror; he broke it by not meeting its requirements. The law did not change, what changed was the behaviour of man in relation to that law - he did not meet its requirements. But since the law was now no longer in his heart, he needed an external source of information as to what was right and wrong. God's law was expanded or amplified as needed to meet the circumstances of His created beings. God will always have a moral law, a standard of conduct. Fallen man needs to understand, by seeing himself in relation to that law, that he is a sinner to help him to sense his other needs. Notice that along with the commandments, in the same promise, He mentions His statutes. Close investigation shows that the statutes and judgments also existed before Mt. Sinai. 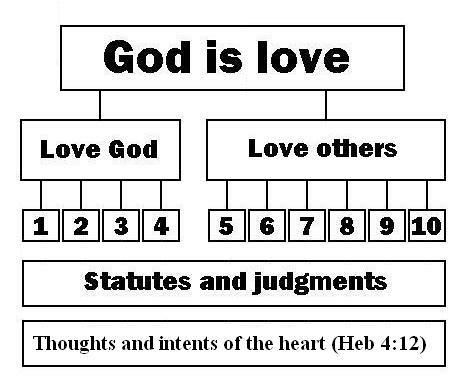 Note that the Ten Commandments and their associated statutes and judgments are not shown as starting at the point of "Sin in Eden" but are, rather, a continuation of God's law from the beginning. 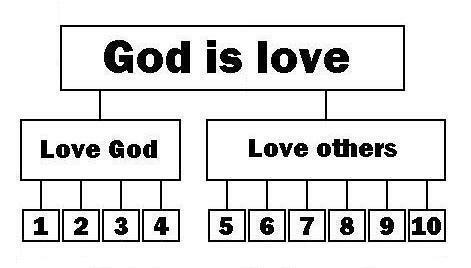 God's law has always existed and been based upon the principle that God is love. The diagram above shows that at the point of sin entering it was further expanded. The diagram below illustrates how it was expanded further to meet the needs to man. The Ten Commandments are shown as expansions of already existing principles. Man's first new need once he sinned - to be able to continue living when he deserved the second death - was immediately supplied by God in the promise of a Saviour. As soon as there was sin there was a Saviour. Man needs a substitute, someone to stand in his place and pay the penalty of his sins for him because he cannot pay on his own behalf. Actually, he can but the price is eternal death and this cuts him off from relationship with God and eternally ends his very existence. Only by having a substitute pay the penalty for him could man be cleared (justified) and not be eternally separated form God. We commonly think of animal sacrifices as substitutes but they only pointed forward to Jesus who was our sacrifice and substitute. Animal sacrifices will be covered more below under the category of reminders. 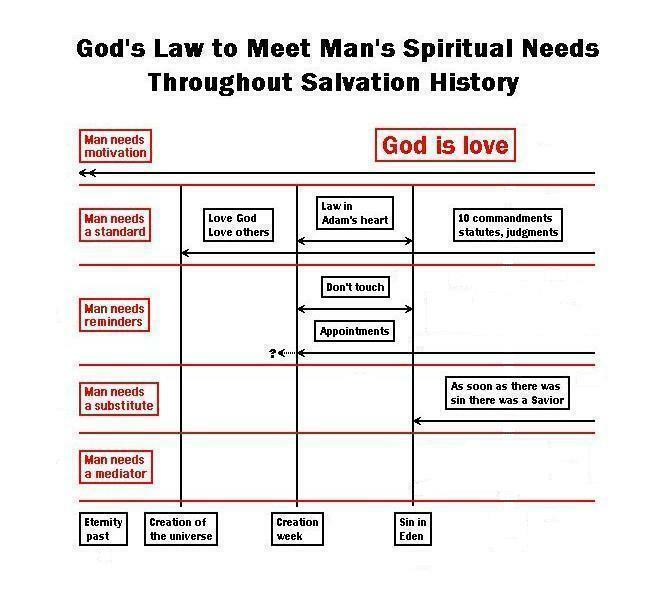 Man's other new need also came immediately when sin occurred because his sin caused a separation between him and God. They could no longer have face-to-face communication. No man has seen God the Father. It is and has been since the fall, the role of the Son to make the Father known or to "declare him." To show what He is really like; especially in character. Without some kind of protecting veil between, the glory of God is too much for man in His sinful state to bear. As soon as mankind sinned, a solution was provided. 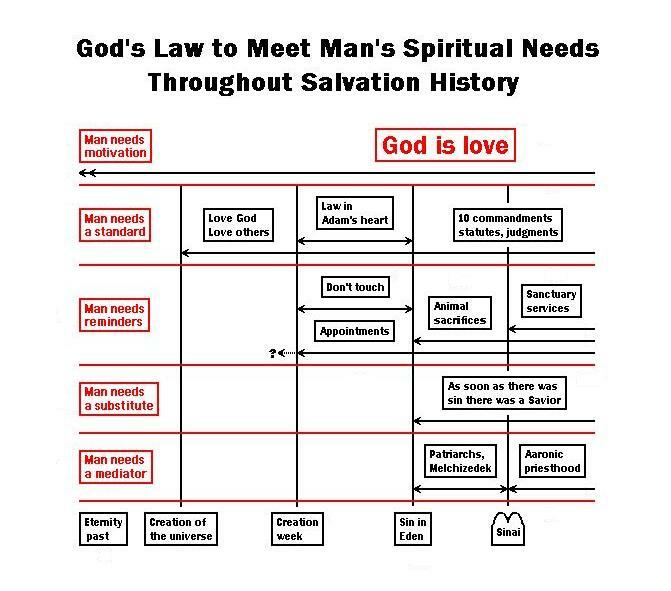 Because man was separated from God, he needed some kind of connection, a mediator, because to be separated from God who is life, means death. Jesus, when He appeared to man to communicate with Him, came with His divinity veiled. He had the form of a man when He appeared to Abraham. Of course, during His incarnation on earth, Jesus was in the form of humanity. He is both "Son of God" and "Son of man"
He knows and is part of both. Any one else who we might think of as a mediator is not, in the true sense of the word. However, God has designated different people (priests) to symbolically function in this role. They have helped point people to their need of reconciliation with God but they do not accomplish it. Their primary function is to point us to the true mediator and high priest - Jesus. The offerings simply pointed to the Saviour. They composed what is often called the ceremonial law. God does not have His people perform ceremonial rites simply for the sake of ceremony, to give them something to do. There has to be a meaning, a purpose behind it. In this case, it is to point them to or remind them of the Saviour to come. Once the reality has come that the ceremony points forward to, the ceremony is, obviously, no longer needed. We just have to sort out and distinguish what is reminder and what among the Jewish economy served other purposes. We will see that man's need of reminders will extend beyond the end of sin. In fact, as we have seen, they existed before sin. Reminders such as the sacrificial system are needed not to provide salvation, which does not come from the sacrifice of animals, but because we are so prone to forget. The reminders help not just to remind but to encourage us. The Bible is loaded with what we call promises and Bible readers are very aware of these and greatly cherish them. We understand that man is never saved or even forgiven just because he offers a sacrifice. But through the faith demonstrated - faith in a promised Saviour to come and what that Saviour would accomplish - man could be cleared of His guilt and the record against him. "Unto Adam also and to his wife did the Lord God make coats of skins, and clothed them." (Gen 3:21). In Genesis 4, Cain and Abel brought offerings. They were instructed in this long before Mt. Sinai. Abraham and many others offered sacrifices. Sacrificial offerings pointed forward to the death of Christ as the great sin offering assuring man that a substitute had been supplied and that God would take care of the problem. Sacrifices are not part of the moral law. In the absence of sin there would be nothing morally correct about sacrificing a lamb rather, the opposite would be true. They were added as a consequence of the breaking of the moral law, as part of the solution. Sacrifices belong in the area of reminders because they were not the substitute itself but only pointed to it. One of the most significant points in history in understanding God's law is the formal giving of the Ten Commandments written in stone and the associated events that occurred at Mt. Sinai. There has been much misunderstanding with many people thinking that the Ten Commandments (moral law) and other laws were first given at Mt Sinai. Sinai did correspond to a spelling out in much more detail of the sacrificial and priestly systems for the people. However, as we have already seen, there already were sacrifices and priests prior to this. 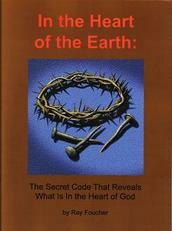 We can see that the principles of God's law were already in place long before and that Mt. Sinai was the point of amplification of both the moral and what has been called the ceremonial law. To some degree, the laws "given" at Mt. Sinai were to meet the needs of the Nation of Israel which was being formed at that time. Standard, substitute, mediator and reminders all existed. The diagram above shows the law (Ten Commandments, statutes and judgments) and man's need of a substitute (as soon as there was sin there was a Saviour) continuing past Sinai. The Ten Commandments were given in a more formal manner and were the basis of a covenant concerning them. It is important to understand that the Old Covenant was not the Ten Commandments themselves but an agreement concerning the keeping of them. Additional statutes and judgments were given also. Of course, man's need of a Saviour continues. We will see that in the area of animal sacrifices and the priesthood there were some changes. "Now therefore, if ye will obey my voice indeed, and keep my covenant, then ye shall be a peculiar treasure unto me above all people" (Exo 19:5). "All that the Lord hath spoken we will do" (Exo 19:8). They had thus, at this point, committed themselves to doing God's will; they had agreed to enter into a covenant with God. What made this the old covenant was that the people were actually dictating how it was to be carried out. They quickly responded even before knowing everything that God would require on their part. After the Lord had made a covenant with Israel they were brought forth to meet with Him. When the Lord spoke his law in what we know as the Ten Commandments in Exodus chapter 20 it was not to give a new law, but to speak with an audible voice in the hearing of all the people, his law which already existed. In Deuteronomy 5, Moses recounts to the people the events of Sinai. He mentions how "The Lord talked with you face to face in the mount" (v4) and gave the Ten Commandments (v7-21). He tells of the people's reaction and desire to not have God speak directly to them but rather to speak through Moses (v24-27, Deut 5:4-5). God then agreed to their request and said to Moses "I will speak unto thee all the commandments, and the statutes, and the judgments, which thou shalt teach them, that they may do them." (v31). It was then that through Moses they were given a number of religious precepts which were to govern the everyday life. These statutes were not the Ten Commandments over again, but the finer points of the law. Here is an illustration: A local law might say that someone building a home must follow the building code. The purpose of the code is to protect the homeowner and anyone who in the future might occupy that home. It could just say to the builder thou shalt build homes using suitable materials and procedures to produce a safe, durable, comfortable, and convenient home. But not all builders would be knowledgeable or dependable enough to do this. So the contents of the code spell out in detail standards and procedures for every stage of the construction. Those standards, in a sense, guard the purpose of the building code itself. Such instruction and the inspections that accompany them are given to avoid mistakes in construction and provide for our safety and well-being. We may not understand or appreciate the finer points of moisture control or load on an electrical circuit but previous wisdom has understood and has set standards for our benefit. All of these statutes and judgments were recorded for the benefit of the Israelites. It wasn't merely God exercising His sovereignty; all were given for the good of Israel. The reason given is to be a witness. How could it be any more of a witness "in the side of the ark" than if it was actually inside the ark? One obvious possibility is that it was placed there for more ready access than if it was on the inside which would necessitate lifting the lid to retrieve it. The Ten Commandments themselves were not new. However, they were expanded upon; given in more detail in the form of statutes and judgments. These were merely the principles of the Ten Commandments amplified in more detail and applied to everyday life. Note that the "ten commandments, statutes and judgments" starting at Sin, continue right past Sinai and into the future. They are an amplification of God's law, not a change. After the completion of the tabernacle, God communicated with Moses from the cloud above the mercy seat to give him full directions concerning the system of offerings and the forms of worship, the ceremonial system, to be maintained in the sanctuary. These instructions for the various offerings were given in Leviticus chapters 1-8. Also, the instructions were given for the outfitting and the responsibilities of the priests. Again, as when we discussed the priesthood of Melchizedek earlier, any one filling the role of a priest has the function of pointing us to the true mediator and high priest - Jesus.